Apple Watch supports the same emoji set as iOS and other Apple platforms, accessed via a scaled-down emoji picker interface. watchOS previously included an animated emoji feature. This provided various options to customize the appearance of various smileys, hand gestures, and hearts. An emoji-like reaction feature for iMessage remains available, allowing a message to be given a variety of responses including 👍, ❤️, and ‼️. Please note: watchOS animated emoji was unrelated to standard Unicode emojis supported by watchOS and iOS, and was also a different feature to Animoji on iOS. 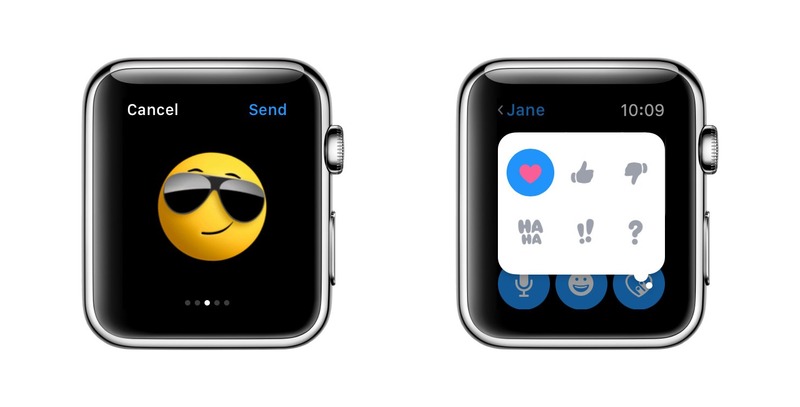 The watchOS animated emoji feature was retired in watchOS version 5.0 released in September 2018. This page archives options that were available. The smiley could be customized to show a number of faces including tongue-out, heart eyes, crying. These came in yellow or red. Hearts were available in red, purple and blue and include wings, arrow, and other animations. Animated emoji gestures available included fingers crossed, shaka, thumbs up, and waving hands.